In the 1890s, a number of problems related to the growth of urban populations caused middle and upper-middle class concern for, and anxiety about, those living in the poor urban centers. While in many American cities this situation was brought about by the shift from an agrarian to an industrial economy, San Francisco's dramatic urban growth was due primarily to mining and its supporting industries. Tenement squalor, crime, labor strikes, and perceived moral decay were seen by some observers as symptomatic of a public in grave need of assistance, and to others as social ills that needed to be controlled, lest they result in deeper unrest or dissent. In 1893, at the World's Columbian Exhibition in Chicago, altruists and cynics alike found a promising solution: a full-scale model for a new urban utopia. 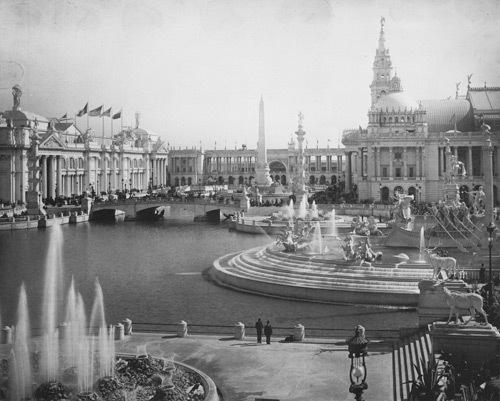 Daniel Burnham's monumental composition of Beaux-Arts style exhibition halls, green space, and ponds would later provide the dominant pattern for civic improvement throughout the United States. The ornate, uniformly brilliant white buildings contrasted dramatically with Chicago's coal-smoke tarnished tenements. (Account refers to this materiality in its uniform treatment of surface.) The "White City," as it came to be known, was a conscious material representation of ideals of dignity, harmony, cleanliness, and order. One tenet of City Beautiful—that the lower classes would internalize the virtues promoted by the aesthetics of redesigned urban centers, thereby elevating the spirit while ameliorating social ills—attracted San Francisco mayor James K. Phelan, who led the effort to commission Burnham to create a master plan for his city. While Burnham's design was ultimately rejected, the aesthetics of City Beautiful and its progressive political tenets nonetheless shaped the civic center that was eventually built. Completed in 1915, Bakewell & Brown's San Francisco City Hall serves as a focal point for the grouping of twelve municipal buildings. The extraordinary Beaux-Arts structure embodies the aspiration of the City Beautiful movement, while combining it with an impulse unique to San Francisco: through its prodigious scale and symbolic motifs (mining, seafaring), it signals the city's understanding of itself as heir to the empires of antiquity, with aspirations to further empire in the Pacific. The unscripted behavior of the children in the film is typical for people encountering the rotunda for the first time. Visitors' movements become self-conscious—even giddy—in the presence of the spectacular, cavernous space; walking slows to a shuffle as visitors crane to take in the dome 200 feet overhead.